Strategic social listening requires the appropriate inputs and analysis to result in real-world outcomes that provide your institution with the insights you need. It can be challenging to explain the concept of social listening to your executive leadership. Strategic social listening doesn’t help you get better at Facebook or go viral on Twitter. And it takes more than software and a techy student employee. So how do you demonstrate this to your executives? 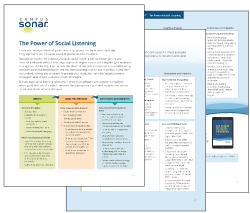 To help you have this conversation with your campus leaders, we created The Power of Social Listening, a three-page handout that explains the strategic impact social listening can have on campus. It outlines a general strategic social listening approach, and demonstrates the approach applied to specific campus goals. I considered myself fairly savvy when it came to social media and digital marketing, until Liz Gross and her team at Campus Sonar helped me realize that I had so much more to learn. Thankfully, they’re excellent teachers, and this guide is evidence of that.